Note: The Cabbage Patch was acquired by Fuller's in June 2011. Our comments below predate this takeover. The interior is quite large and so is the beer garden/car park, although there is very little room on match days. 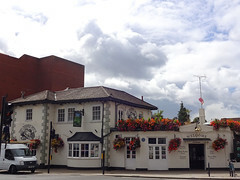 In fact, the place is heaving on match days, what with it being one of the closest pubs to both the railway station and Twickenham Stadium. Smoking is permitted in the beer garden. Even on match days the Pride is passable, and the Guinness okay. As of July 2007, food is served noon-3pm, 6pm-10pm Mon-Fri; and noon-7pm Sat-Sun. They often have a Sunday roast on Sundays, and if the weather's nice they might have a barbecue. Last visited by bob, November 2009. Food details and smoking area details verified by phone, 8 July 2007. Last edited 2017-09-13 08:35:21 (version 18; diff). List all versions. Page last edited 2017-09-13 08:35:21 (version 18).